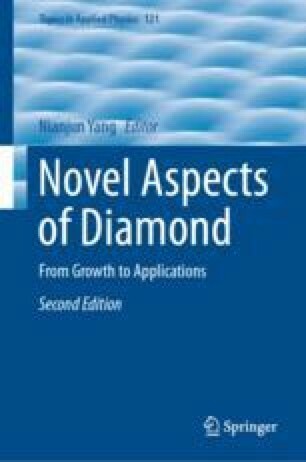 In this chapter, it focusses on nanodiamond. Nanodiamond is a type of diamond, which is a type of nano-carbon materials. In other words, nanodiamond is an allotrope of nano-carbon materials as same of fullerenes, carbon nanotubes, and graphene. The nanodiamond have universal properties of other nano-carbons typified by like an excellent thermal conductivity and also have antimicrobial properties and high refractive index properties at the same time. On the other hand, like other nanocarbons, it has extremely remarkable aggregation properties. Although it is a substance of a sphere with a minimum primary particle diameter at 5 nm prepared by detonation method, its outermost surface is covered with an adsorbed water nanolayer in order to stabilize the structure. As a result, it is dispersed in an aqueous solution, but it is difficult to disperse in an organic solvent or an organic polymer. Therefore, in this chapter, it will introduce a variety of research examples by surface modification to change nanodiamond into a easier-to-use material. The authors appreciate Prof. Shuichi Akasaka, Tokyo Institute of Technology for research collaboration in many related works. Further, authors also thank Dr. Yuji Shitara, Mr. Akira Tada, Mr. Takumi Yamamoto, Mr. Tatsuki Nakajima, JXTG Energy Co. Ltd., for useful discussion. In addition, authors appreciate Mr. Koichi Umemoto, and Dr. Daisuke Shiro, DAICEL Co. Ltd., for the providing of nanodiamond samples. Finally, authors thank Prof. Tomofumi Ugai, Bio-nano electronics research center, Toyo University, for the lecture of DLS measurement.